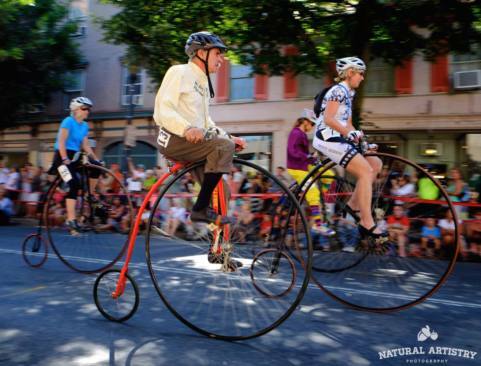 Frederick, Maryland, is home to The National Clustered Spires High Wheel Race. This unique event will take place in historic downtown Frederick on Saturday, August 13, 2016. Racers ride original and replica high wheel bicycles dressed in vintage clothing. The race will begin at 3pm in front of Brewer&apos;s Alley. It will be a one-hour, multi-lap race of high-wheels along a 0.4-mile route through the downtown. Have you ever experienced the thrill of a high wheel race? If the X Games had existed in the 1870s, high wheel bicycling would certainly have been one of the extreme sports featured at the games. Today, X Games enthusiasts are on the edge of their seats watching as cyclists attempt the Mountain Bike Slopestyle event. High wheel bicycling, also known as penny farthing, could easily be considered the Victorian-era equivalent. Instead of mountain bikes flying off ramps and catching air, riders attempt to get on and stay on the bikes and not go flying off of them head-first. Imagine a bicycle with one gear and a seat that’s nine feet off the ground…without brakes! Mounting a high wheel bicycle is a challenge requiring a great deal of skill and balance. Once a person masters that feat, there’s the danger of headers. The seat is positioned nearly over the front axle, which means that when the front wheel hits rocks or ruts or when hard braking is required, the rider can be pitched forward, usually head first. Today we have helmets, but in the 1870s, broken bones and head injuries were common results of riding the high wheel bicycle. Don’t miss this thrilling must-see event in Frederick! It only happens once a year and you won’t find it anywhere else in the nation!